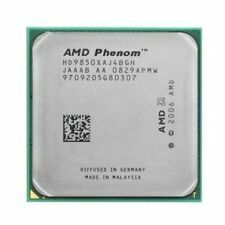 Used AMD Phenom X4 9850 HD9850XAJ4BGH Socket AM2 2.5 GHz CPU. Trending at $24.92eBay determines this price through a machine learned model of the product's sale prices within the last 90 days. You can see the serial number on the chip, I know it's a 9850 Black Edition, the internet says it's an X4 so I've included it with the title. HD985ZXAJ4BGH is an OEM/tray microprocessor. Sockets Socket AM2. Socket AM2 . AMD Phenom X4. Model number 9850. Notes on AMD Phenom X4 9850 (125W, BE). Type CPU / Microprocessor. CPU part numbers. Trending at $21.00eBay determines this price through a machine learned model of the product's sale prices within the last 90 days. AMD HD9850XAJ4BGH Phenom X4 9850 Processor - Quad Core, 2MB L3 Cache, 2MB L2 Cac. Condition is Used. Shipped with USPS First Class Package. AMD Phenom II X4 940 1800MHz 3GHz Socket AM2 CPU Processor. AMD Phenom II X4 965 Quad Core 3.4GHz Socket AM3 6MB 125W CPU Processor. AMD FM2 904 pin CPU. AMD 938 pin CPU. AMD 940 pin CPU. AMD Athlon X4 860K Quad Core FM2 3.7Ghz 95W 4MB CPU Processor. (HD985ZXAJ4BGH). HD985ZXAJ4BGH is an OEM/tray microprocessor. Family AMD Phenom X4. Sockets Socket AM2. Socket AM2 . we specialize in computer accessories and so on. AMD64 / AMD 64-bit technology ?. AMD-V / AMD Virtualization technology. Clock speed (GHz). Processor Type. Bus speed (MHz). After Sale Socket Type. 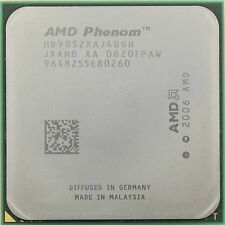 Phenom X4 9850 2.5 GHz Quad-Core (HD9850XAJ4BGH). Model : HD985ZXAJ4BGH. AMD Phenom X4 9850 Black Edition. Manufacturer : AMD. Clock speed : 2.5 GHz. Your recognition is our power to move forward, especially to a beginner like us. Other country. New Zealand. Canada &Australia&. FamilyAMD Phenom X4. CPU Clock2.5 GHz. Processor Socket Socket AM 2/AM2 . Processor only, no accessories included. Bus speed (MHz)2000 MHz. In 100% working order. Number of Cores 4. Level 2 cache 4 x 512 KB. 1 x Cooling paste(free gift). No one is EVER ignored! AMD Phenom X4 9850 Black Edition HD985ZXAJ4BGH generación Agena, para Socket AM2 y AM2 , cuádruple núcleo físico a 2,50 GHz de velocidad con 2 MB de Cache L2 y 2 MB de Cache L3, Velocidad del Bus 2000 MHz HyperTransport 3.0, 65 NM y TDP de 125 W.
AMD Phenom X4 9850 HD9850XAJ4BGH / WCJ4BGH generación Agena, para Socket AM2 y AM2 , cuádruple núcleo físico a 2,50 GHz de velocidad con 2 MB de Cache L2 y 2 MB de Cache L3, Velocidad del Bus 2000 MHz HyperTransport 3.0, 65 NM y TDP de 125 W máx. AMD Phenom X4 9850 HD9850XAJ4BGH o HD9850WCJ4BGH, generación Agena, para Socket AM2 y AM2 , cuádruple núcleo físico a 2,50 GHz de velocidad con 2 MB de Cache L2 y 2 MB de Cache L3, Velocidad del Bus 2000 MHz HyperTransport 3.0, 65 NM y TDP de 125 W máx.